Amanda and Dave Repsher stand in front of their newly remodeled home Saturday, Nov. 17, in Silverthorne. Coming home was a major step for the couple as they try to reclaim pieces of their lives lost in a July 2015 helicopter crash in Frisco. Flight For Life helicopter crash survivor Dave Repsher, left, and his wife, Amanda, chat while on a walk with their dogs Saturday, Nov. 17, near their home in Silverthorne. Dave sustained full-thickness burns on 90 percent of his body when the helicopter crashed in July 2015. 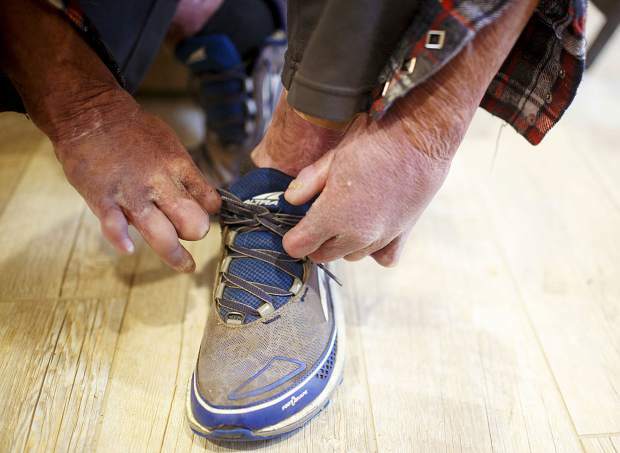 Former Flight For Life nurse Dave Repsher ties his shoes with effort Saturday, Nov. 17, at home in Silverthorne. Dave sustained full-thickness burns on 90 percent of his body in a July 2015 Flight for Life helicopter crash. Coming home was a major step for Repsher as he tries to reclaim pieces of his life lost in a July 2015 helicopter crash in Frisco. 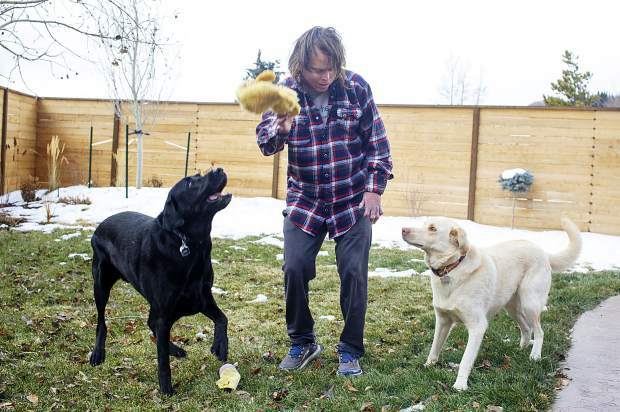 Dave Repsher plays with his dogs, Tucker, left, and Turq, in the backyard Saturday, Nov. 17, at home in Silverthorne. 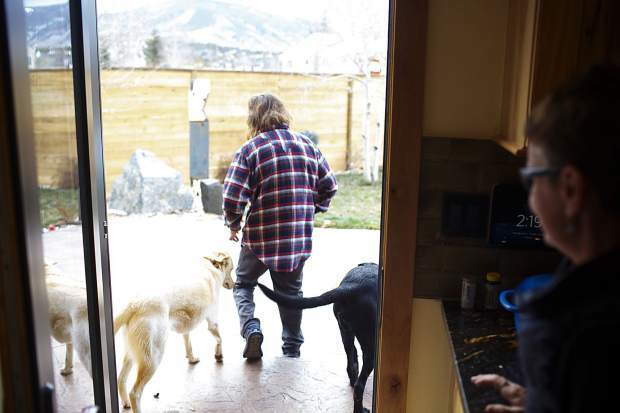 Dave Repsher heads out the backyard with, Turq, left, and Tucker, Saturday, Nov. 17, at home in Silverthorne. 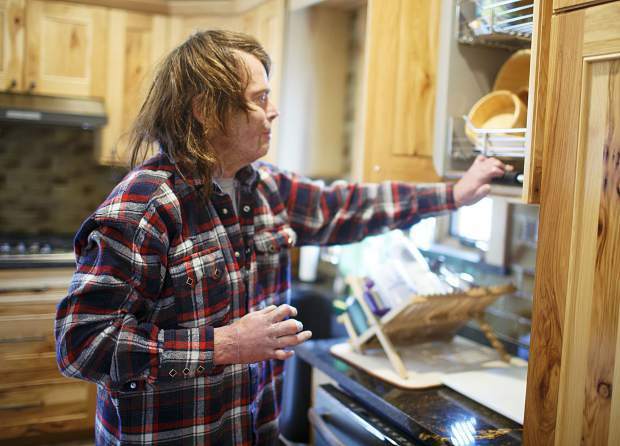 Dave Repsher uses the handicap friendly roll down shelves from the kitchen cupboards Saturday, Nov. 17, at home in Silverthorne. 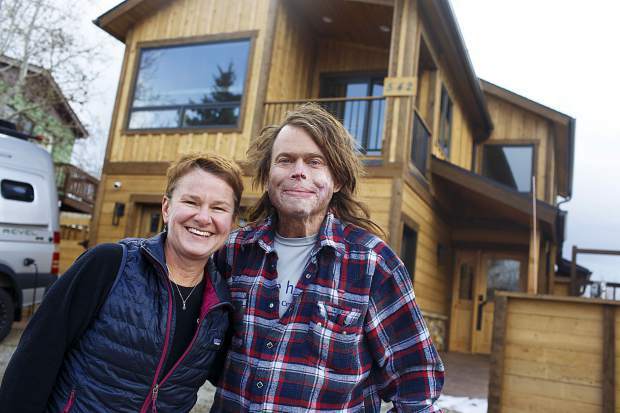 Many people helped Dave and Amanda Repsher remodel the couple's home, making it more comfortable for Dave Repsher, who was badly burned in a July 2015 helicopter wreck. 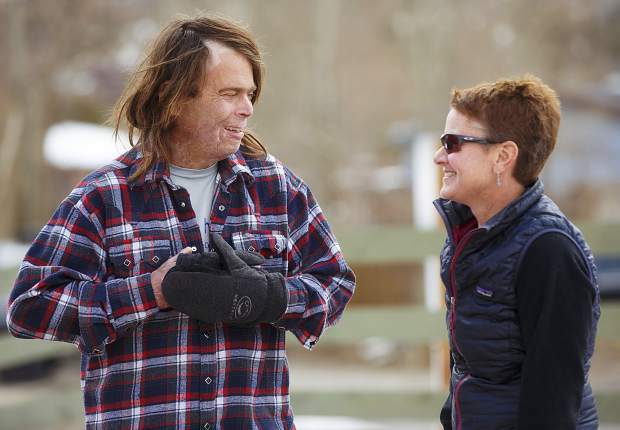 Flight For Life helicopter crash survivor Dave Repsher, left, and his wife, Amanda, chat while on a walk with their dogs Saturday, Nov. 17, near their home in Silverthorne. 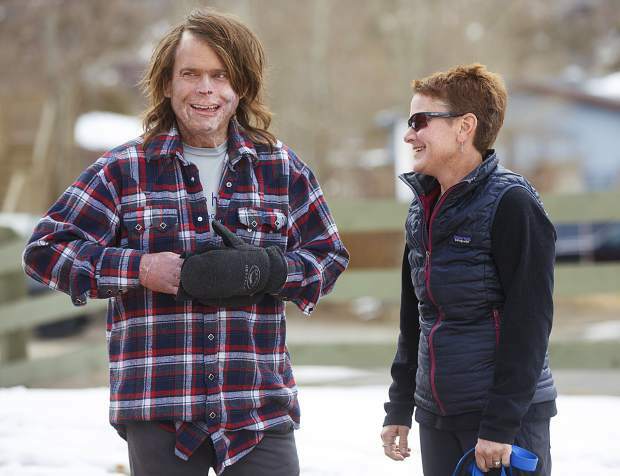 Dave sustained full-thickness burns on 90 percent of his body in the July 2015 helicopter crash. Amanda and Dave Repsher in front of their home Saturday, Nov. 17, in Silverthorne. 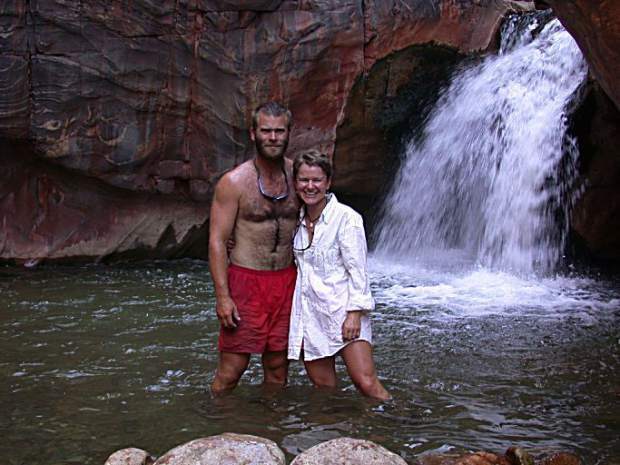 Husband and wife Dave and Amanda Repsher pose for a photo during a rafting trip on the Colorado River through the Grand Canyon in this undated photo provided by the Repshers. 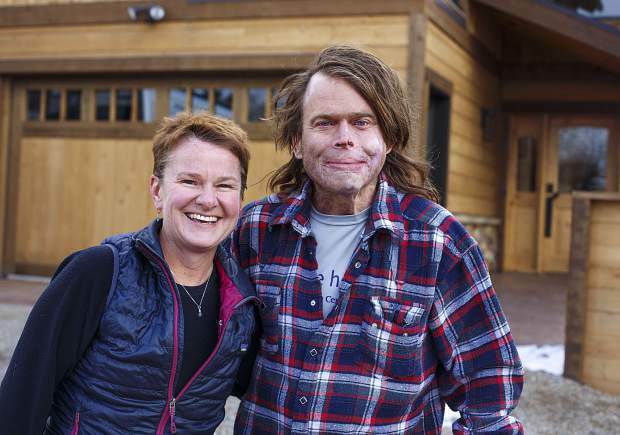 Dave Repsher was badly burned in a July 2015 Flight For Life helicopter crash and has been fighting to reclaim pieces of his life ever since. 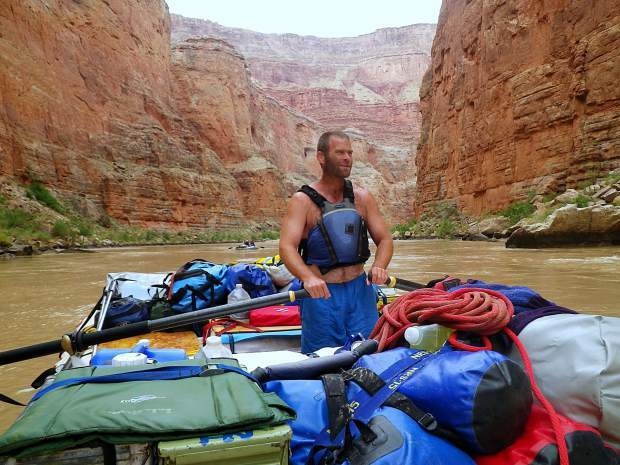 Dave Repsher mans the oars during a rafting trip through the Grand Canyon in this photo provided by Dave and Amanda Repsher. Dave Repsher was badly burned in a July 2015 Flight For Life helicopter crash and has been fighting to reclaim pieces of his life ever since. One major step was moving home to Silverthorne. Another one will be getting back on the water. 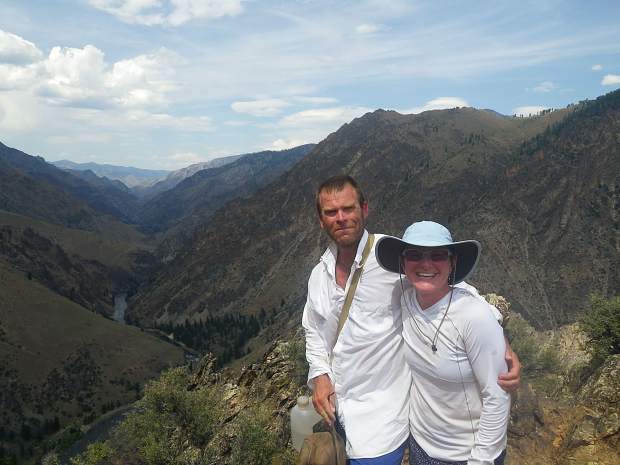 Dave and Amanda Repsher pose for a photo together during one of the couple’s rafting trips. Dave Repsher has been fighting to reclaim pieces of his life since the former Flight for Life nurse was badly burned in a July 2015 helicopter crash in Frisco. 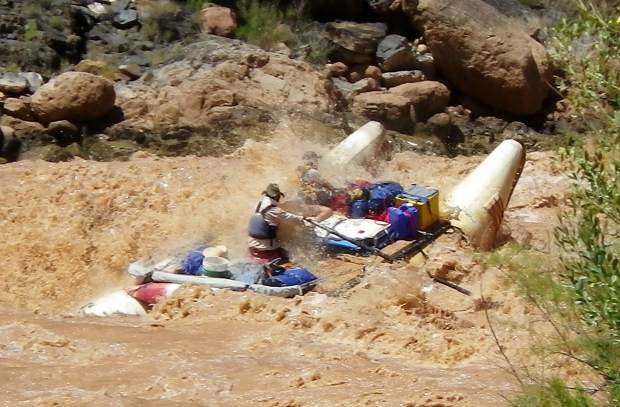 A former Flight For Life nurse, Dave Repsher rows a raft through whitewater rapids in this photo provided by Dave and Amanda Repsher. Dave Repsher suffered full-thickness burns to 90 percent of his body in a July 2015 Flight for Life helicopter crash. Dave and Amanda Repsher are still unpacking some of their belongings from the cardboard boxes neatly stacked along the walls of their newly remodeled Silverthorne home. Most people dread the moving process. For the Repshers, it’s a pivotal step in the couple’s ongoing effort to reclaim pieces of their lives lost in a fiery 2015 helicopter crash that destroyed Dave’s body, but not his will to live. After nearly three years away from home, the place where Dave grew up and Amanda adopted, the couple feels glad to be back. And they made it just in time to celebrate Dave’s 49th birthday, one that coincidentally falls on Thanksgiving this year, a fitting alignment considering how thankful he feels these days. 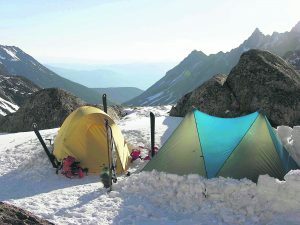 “That was always the goal — to get home,” Dave said as he and his wife sat down with the Summit Daily News inside their home, with the couple’s dog, Turq, by Dave’s feet. The accident that left Dave disfigured sparked Congress to enact new regulatory measures mandating that helicopter manufacturers install crash-resistant fuel tanks on new emergency aircraft when lawmakers passed a five-year funding extension of the Federal Aviation Administration. A Flight For Life nurse, Dave was sitting in a rear seat of an Airbus helicopter on July 3, 2015, when it spiraled out of control shortly after takeoff from St. Anthony Summit Medical Center in Frisco. The crew was running a public relations flight to a Boy Scouts camp in Gypsum, but the helicopter had only climbed about 100 feet before it careened into the parking lot next to the hospital. Still buckled into his seat, Dave was ejected with the seat and caught underneath a helicopter door, which also broke free in the violent collision. The impact caused the helicopter’s fuel tank to rupture, spilling jet fuel all over the ground and dousing Dave. Video shows the crash site burst into flames only seconds later, and Dave suffered full-thickness burns to 90 percent of his body. 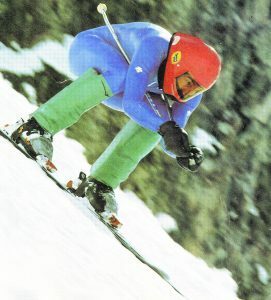 The pilot, Patrick Mahany, died in the wreck. Another nurse aboard the chopper, Matt Bowe, suffered severe injuries but returned to work about four months after the crash. Initially treated in the parking lot in Frisco, Dave was soon flown to University Hospital in Denver. He wasn’t supposed to survive 24 hours due to the extent of his injuries, but after 13 months fighting for his life with his wife at his bedside, Dave left the hospital against all odds in August 2016. Throughout the whole ordeal, Dave has faced an uncertain future, but he hasn’t faced it alone. His recovery will be a slow, lifelong process that will never really come full circle, but the man who has made a career out of helping others is keeping his sights fixed on getting back to the things in his life he loved so much. Had it not been for the helicopter’s malfunctioning hydraulics that rendered the tail rotor useless, for the after-market seat that broke free in the crash or for loopholes in safety regulations that allowed the helicopter to fly without a crash-resistant fuel system, the circumstances surrounding the crash might have turned out very differently. A lawsuit filed by the Repshers in district court details all of these “what ifs” and more, as the Repshers alleged gross negligence on the part of Air Methods and Airbus, the operator and the company that built the helicopter, while saying Dave could have otherwise survived the crash with very few injuries. 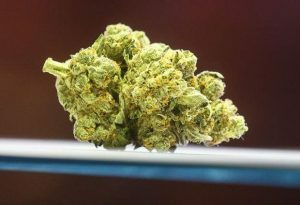 The Repshers resolved the case by agreeing to settle out of court for $100 million. The settlement was widely reported across the country for two reasons: The sum was believed at the time to be the largest pre-trial settlement in U.S. history and the Repshers refused to sign any kind of nondisclosure agreement. 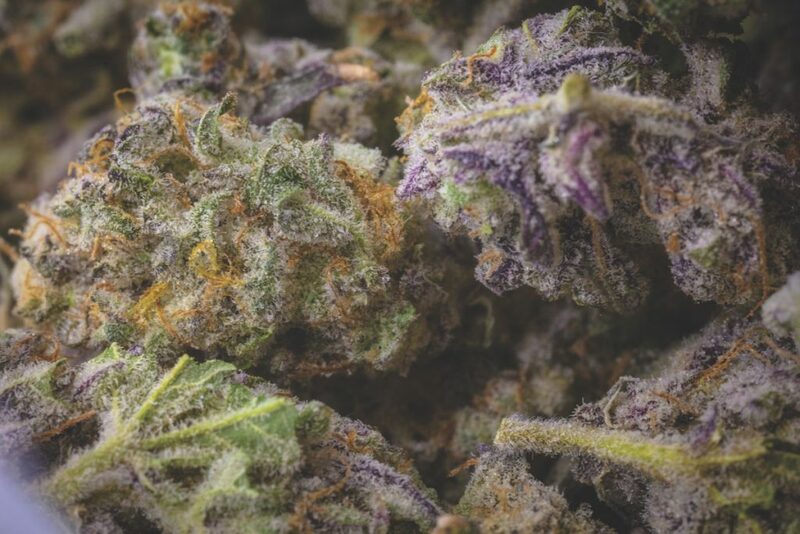 The Repshers said by refusing to sign such an agreement, it would mean forfeiting their privacy. Anyone who thinks that $100 million sum exorbitant should first consider that Amanda said her husband’s medical bills have already hit $20 million and it’s estimated he’ll need another $40 million more worth of medical care over the course of his lifetime. Subtracting medical bills, attorney’s fees, legal costs and other case expenses, the record-breaking figure looks a lot less like the Powerball jackpot some have made it out to be. Additionally, the Repshers are using a portion of the settlement money to set up the Dave and Amanda Repsher Foundation, which they plan to use to lobby for stricter flight safety standards, promote organ donations, support burn victims and offer some local scholarships. 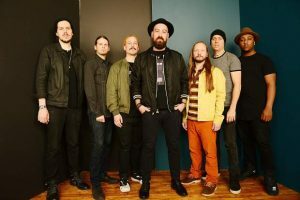 “We’ve gotten so much support I think it’s just, for both of us, it feels right to do something to help give back a little bit,” Repsher said. Repsher’s family moved to Summit County when Dave was in elementary school. Like so many other locals, he easily gravitated to the outdoors early in life and became an avid rafter, kayaker, skier, biker and hiker in his adult years. He also loved playing hockey. Since the July 2015 crash, Dave’s daily mission has been to get back as many of the pieces of his life as he can. So far, hiking with his dog Turq has been a welcome step forward. After undergoing numerous surgeries on his hands, Dave is closer to getting back on a bike, but braking and balance remain his biggest issues. He’s also been ice-skating again about once a week, leaving the hockey fanatic hopeful he’ll soon be playing the sport again, too. The Repshers used to love discovering strange, new rivers together as they sought waterways with no permits required and dogs allowed on rafting trips. Unhealed wounds on Dave’s legs have prevented him from going back into the water so far, but he sees a good float in the not-too-distant future. Dave isn’t ready to get back on skis just yet either, but he’s been volunteering with Copper Mountain Resort, where he previously worked as a ski patroller and paramedic, as he helps with guest services and “meet ‘n’ greet kind of stuff.” Volunteering keeps him busy, said Repsher, who has his own wishes of skiing Copper, perhaps as soon as this season. Skiing or rafting together would be a major milestone for the Repshers, but one of the biggest steps forward has already come to fruition: moving back home. The Repshers will continue to keep a townhome on the edge of the University Hospital campus, as Dave will have many, many ongoing medical needs. 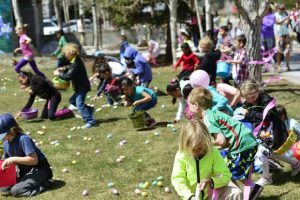 Still, they moved back into their house in Silverthorne this September, making their return to being full-time Summit County residents. To help make it happen, an armada of people rallied around the Repshers and even rebuilt the couple’s home. These people donated their time, the materials and dropped whatever they were doing to get the project off the ground, the Repshers said. Two contractors were instrumental in the work — Todd Goode’s and Andy Spinner’s construction companies — and many other people had a hand in the extensive work done to the Repshers’ house as well. “Everybody wanted to get us home,” Amanda said. Many of the companies and people who helped wouldn’t take a penny and she and her husband are looking forward to thanking every one of them. A connection made through Copper Mountain, Dave found the kidney he needed from Matt Martinez, even though the two never really knew each other beforehand. The Repshers said they both know they can never repay Martinez for the gift he gave them. 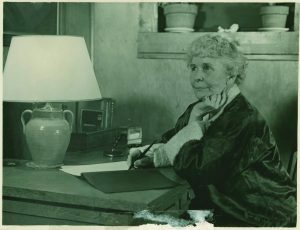 And the support came on all levels — countless visits, cooked meals, dog walking and so much more. Organized by Neal Bocksch, the “D-Rep Support Team,” armed with T-shirt, hoodies, hats, stickers and other gear, organized fundraisers for the couple, and Dave’s hockey team was another big source of support. For almost two years, the Repshers stayed with their friends in Summit Cove, the Kelble family, while the Repshers’ home was remodeled and they worked on returning to Summit County full time. During this time that the Kelbles opened up their home to the Repshers, specifically the entire basement, Dave and Amanda filled it with boxes and machines for his kidney dialysis. Another friend, neighbor George Altz, took care of Turq for over a year, which was huge for the Repshers while Dave was hospitalized in Denver. There, Dave Rephsher’s mother and stepfather, Marilyn and Dave Raymond, were unwavering visitors as well, and “the rock” Amanda needed to get through this. So many things have come together, the Repshers see the crash in a way that isn’t framed in tragedy. Had the helicopter not crashed in the hospital parking lot, Amanda explained, her husband wouldn’t have gotten the immediate treatment he needed and probably died. Had the helicopter had a patient on board, had Dave not been rushed to Denver in another helicopter, had a host of other things all not come together so perfectly, her husband wouldn’t likely be with her. “There’s just piece after piece,” Amanda said. The reality of Dave Repsher’s situation is there will always be medical appointments that come up and he’ll never have the life he did before the crash. The good news is those appointments are getting further and further apart, and even though Dave was so badly injured, he and his wife feel blessed to be so loved. This article originally ran Nov. 18, 2018. 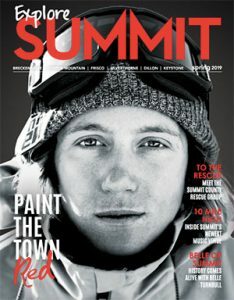 It is featured in the 2019 Explore Summit spring magazine.